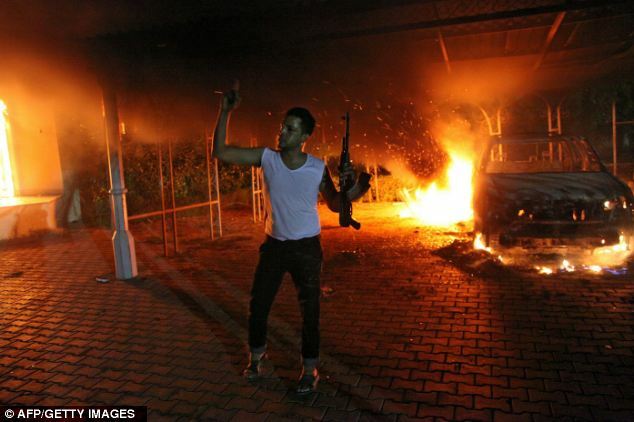 – Revelations shed new light on the effectiveness of the CIA at Benghazi and the level of support they were given. – When the CIA annex come under attack the field agents were denied a request for military help despite a counter terrorism team being two hours away in Italy. – There was full communication between operatives on the ground and headquarters – with the ability to laser guide drones, planes or special forces to enemy targets. 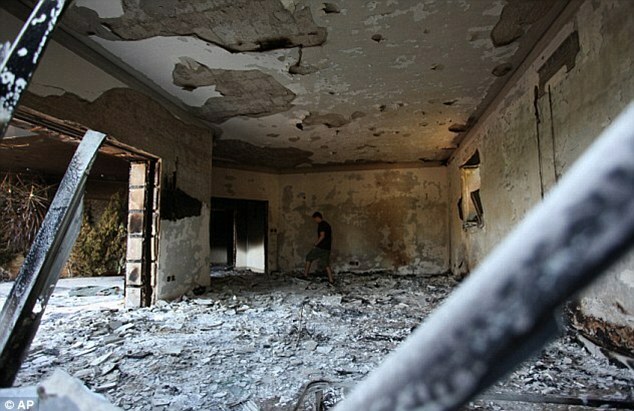 Revelations: It has been claimed today that CIA operatives at the Benghazi consulate compound repeatedly had their requests for help denied during the deadly assault on September 11. The lethal assault which led to the death of Ambassador Stevens and three other U.S. citizens began at 9.40 p.m. as the U.S Consulate came under fire from hostile Libyan forces. According to Fox News, ex-Navy SEAL Tyrone Woods, who was part of a small team at the CIA annex about a mile from the consulate, asked his superiors if he could go and assist the embattled diplomatic compound. However, they were told to ‘stand down’ and according to sources who spoke to the news channel were told to ‘stand down’ again after asking for a second time to help Ambassador Stevens and his staff. Ignoring these orders, Woods and two others heroically made their way to the consulate which by now was ablaze and began firing on the attackers. Knowledge: It is unclear who denied the requests of the CIA for special forces teams. The quick reaction force which Woods was part of helped an evacuation of the main building and recovered the body of State Department staff member Sean Smith who had died in the initial attack. However, the team from the CIA annex could not locate Ambassador Stevens and returned to their own base at around midnight where they came under attack themselves. Immediately calling for assistance from Sigonella Air base in Italy which is two hours away, it is claimed that two separate special operations teams and air support were told to wait – despite the gun battle raging for four hours. It is not known who denied the request for help for the CIA operatives on the ground at Benghazi. If true these claims will radically change the perception of the field agents who were operating on the ground in Benghazi. Previously criticised for providing inadequate security for the consulate staff, the new information shows intelligence operatives repeatedly tried to assist and in fact were denied their own requests for outside help. Refuting the Defense Secretary Leon Panetta’s claim yesterday that there simply wasn’t enough information to responsibly deploy forces to Libya at the time of the attack, sources on the ground claim that communication was open throughout the attack. Indeed, one member of the CIA team who was on the roof of the annex was in possession of a laser to guide aerial targets including drones and repeatedly requested backup from a Specter gunship to take out an attacker firing mortars. According to sources familiar with the situation, the operative had visual contact with the Libyan mortar team and in addition was able to pinpoint positions from where the consulate attackers were firing from. 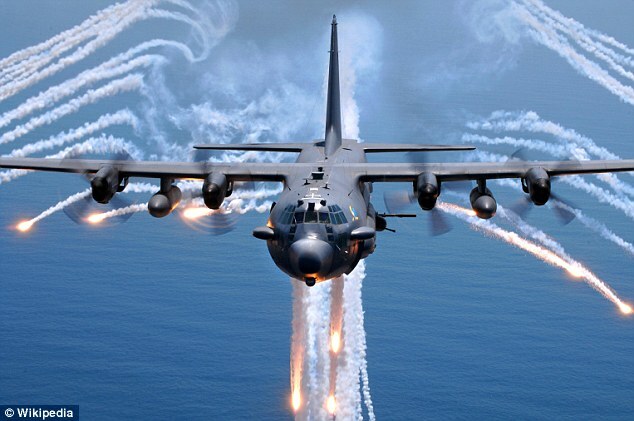 A CIA operatives request for an AC-130H gunship to take down a Libyan mortar position was denied. 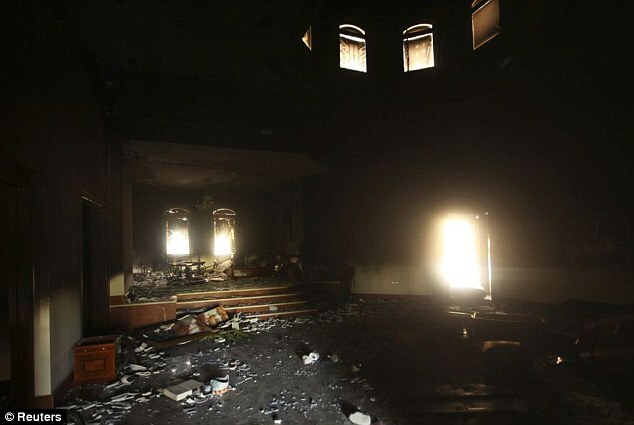 Inferno: Armed attackers dumped cans of diesel fuel and set ablaze the consulate’s exterior. Siege: The compound came under heavy mortar and gunfire during the attack, which lasted several hours. ‘This happened within a few hours and it was really over before, you know, we had the opportunity to really know what was happening,’ said Panetta. Furthermore, Fox News has learned that there were two military surveillance drones above the skies of Benghazi during the attack which would have been able to relay real time visuals of the assault to U.S. officials in the White House situation room and the Pentagon. Tyrone Woods and another former Navy SEAL Glen Doherty were killed by a mortar shell at 4 a.m. Libyan time, over six hours after the attack began and just one hour after relief from an American Quick Reaction Force sent from Tripoli had arrive. This new information comes as President Barack Obama’s response to the attacks in Libya has become a contentious issue in the hard-fought U.S. presidential race, with Republican opponents raising questions about his administration’s truthfulness and competence. 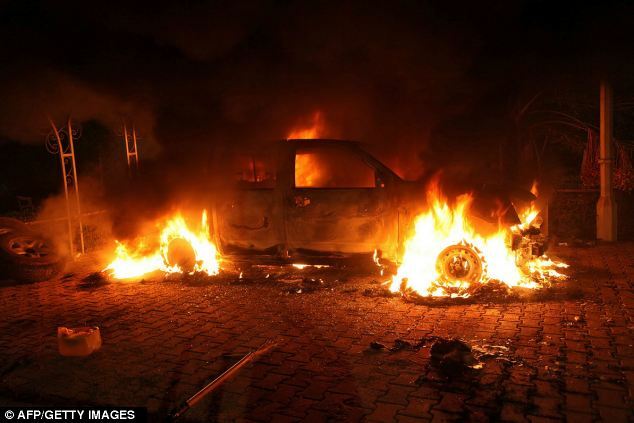 Obama supporters have in turn accused Republicans of making unfounded accusations in an effort to score political points from the death of a U.S. ambassador and the three others killed in the Benghazi attack. 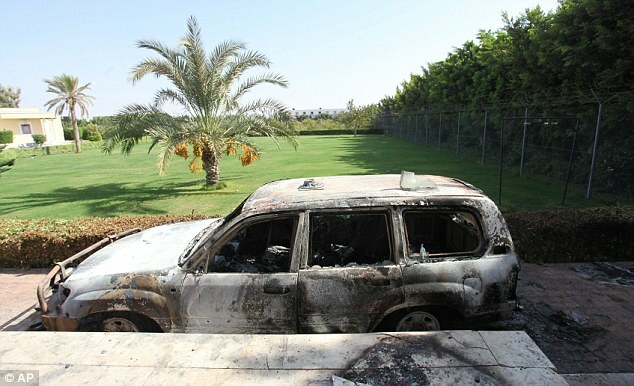 Flames, grenades and gunfire: A burnt-out car in front of the U.S. consulate. ‘Can you explain what options were presented to you or your staff, and why it appears assets were not allowed to be pre-positioned, let alone utilized?’ Boehner asked. Defense Secretary Leon Panetta told Pentagon reporters that U.S. forces were on a heightened state of alert already because of the 11th anniversary of the September 11, 2001, attacks on New York and Washington by al Qaeda. In the aftermath of the attack, Panetta reminded reporters that the Pentagon deployed a Marine fleet anti-terrorist security team to Tripoli and had Navy ships off the coast. ‘And we were prepared to respond to any contingency. And certainly had forces in place to do that,’ he said. Elite team: As the U.S. consulate in Benghazi came under a devastating attack last month, a rescue team of elite soldiers was denied the opportunity to assist the CIA who had come under attack. The administration initially attributed the violence to protests over an anti-Islam film and said it was not premeditated. Obama and other officials have since said the incident was a deliberate terrorist attack. A State Department email made public this week showed that two hours after the attack on the U.S. diplomatic mission compound in Benghazi, the Department’s Operations Center advised officials at various U.S. agencies that a militant group called Ansar al-Sharia had claimed credit on Twitter and Facebook for the attacks. U.S. officials, including Clinton, on Wednesday said that such Internet postings did not constitute hard evidence of who was responsible for the attacks. The State Department has set up an independent review board to investigate the background and response to the attacks. The U.S. Senate intelligence committee on Thursday said it will hold hearings in November – after the November 6 presidential election – on security and intelligence issues raised by the September 11 attack in Libya.